The Pointer, often called the English Pointer, is a somewhat large dog whose slim physique, lightning speed and soft mouth (meaning it carefully picks up wounded birds and other game) is renowned the world over. They make excellent gun dogs, and a number of clubs have been devoted to specializing Pointer bloodlines since the breed's conception more than 200 years ago. English Pointers are, first and foremost, hunting dogs. They are great family pets so long as you set aside a lot of time every day for play, exercise and other activities. They are not for inexperienced people, and they are ideal for those with a lot of hunting dog experience. The only real Pointer problems come from the dog's stubbornness, and this can occur if they are not restrained and give chase. If this happens, they can be very difficult to retrieve if they are not propeller trained. 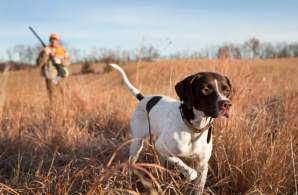 Pointers are bird dogs that have long made great gun dogs but can be difficult to train and control even as they are otherwise fun to be around. In understanding Pointers, you should know that they get big rather quickly yet remain puppies in their personality. They were once extremely prominent dogs but over the decades. While their popularity has fallen dramatically, they remain revered for their ability to perform well in field trials. There are fewer dogs that are more able to take to the field and remain dedicated to their task than the English Pointer. They are born with the desire to find game and in particular point birds, and they have the ability to reserve their serious strength for the hunt. Once home, they become playful and mischievous, and they'll love keeping their wits sharp with agility toys and play. Although very stubborn and easily distracted, Pointers are known for their loyalty. The time required to train them is well worth it, however, as you will have a dog whose ability to respond is astounding. When not working, they are eager to play but ever watchful as well. They will alert you to anything odd, and strangers will be warned off long before they can get close. Pointers have boundless energy, and you'll probably tire out long before this dog does. If you don't have them alongside you very frequently for the hunt, you will need to exercise them for a couple of hours daily. This breed gets very bored very quickly, and they will quickly see to burning up their energy with destruction that they tend to see as just play. 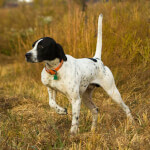 The Pointer could be defined as a gun dog waiting for the development of firearms to catch up. This excellent hunting dog has been around since the mid-17th century; English Pointer history has its first records dating back to 1650. The breed was developed to replace the slower, heavier Spanish pointers that nevertheless had the keen ability to point game. Once the Pointer breed was basically established, they were used in conjunction with Greyhounds, who went in for the kill after game was pointed. It's believed that Englishmen exported the dogs from a Spanish-controlled territory in the early 1600s. Once home in Britain, the dogs were most likely developed to be faster, agiler and to have a superior sense of smell. This may have involved crossing the Spanish breed with Bloodhounds, Foxhounds, Greyhounds and perhaps Bull Terriers. 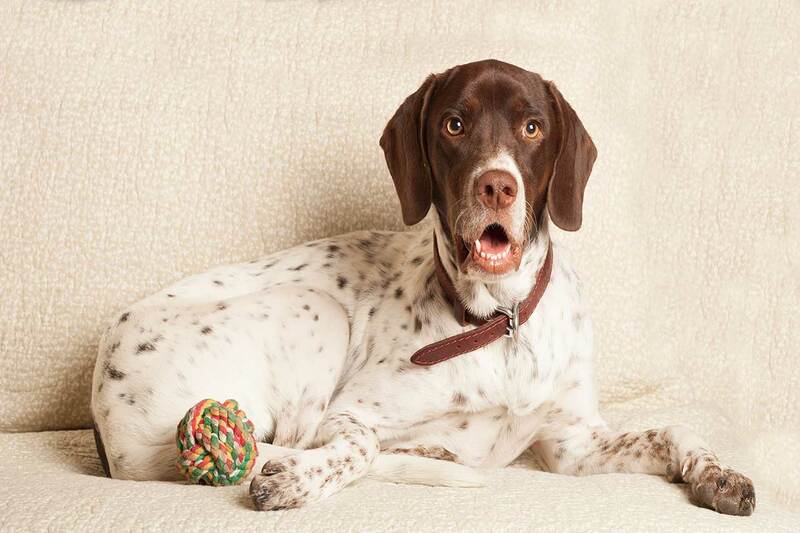 Setters may have been later used for the purpose of calming the Pointer's unruly temperament. These dogs may have been exported to North America when or shortly after the colonists arrived, but they weren't noted much until the mid-19th century. They were very popular bird dogs before the American Civil War. It's thought that the Westminister Kennel Club (WKC) was formed to further develop the breed. To this day, the Club is known for its silhouette logo of a Pointer named Sensation. The WKC wanted prime Pointer breeding stock, and in 1876 they acquired "Don." The Club renamed the dog Sensation. A painting was commissioned to capture the lemon and white-coated wonder, and engravings were also made. In one form or another, Sensation has remained almost always the WKC's logo for nearly 150 years. Pointers were formally recognized by the American Kennel Club (AKC) in 1884. These dogs were among the first eight breed to be registered in the stud books of the National American Kennel Club in 1878 which later became the AKC. In 1938, the American Pointer Club was founded. The universally recognized Pointer stance is that of a dog with a perfectly straight back, the tail up and most everything parallel to the ground with the head thrust forward toward the bird or other game. The posture is complete with one foot up, ready to retrieve what is soon to be shot. The "dish face" is one of the two terms you should know: the ubiquitous silhouette of the breed's chiseled head that is often imprinted on collectors' plates. The Pointer nose is large and has huge nostrils. The ears are short and around eye level. The ears are thin and appear hairless. When working, they will be erect and straight. At rest, they drop straight down. The muscular neck leads down to a lithely muscled and somewhat square body topped by long shoulder blades. The back is basically straight, short and solid. The deep chest reaches about halfway down the straight and strong front legs. The rear legs are very also very strong. The "bee tail" is the other term that Pointer owners often use. The typical Pointer coat is short with dense, tight hair that has a shine to it. The number of English Pointer colors tends to be debated. The American Kennel Club (AKC) states there are eight, but most people say there are four. Some people may think a darkly colored orange dog is a red Pointer dog, but they are still officially orange (or orange and white). There are solid black Pointers too, but they seem to be rare. Blue pointers are actually black but with the black being lighter to appear blue. Other color names such as grey, brown, or chocolate are basically shades of the established colors listed below. Perhaps the rarest of all colors is the tricolor Pointer. 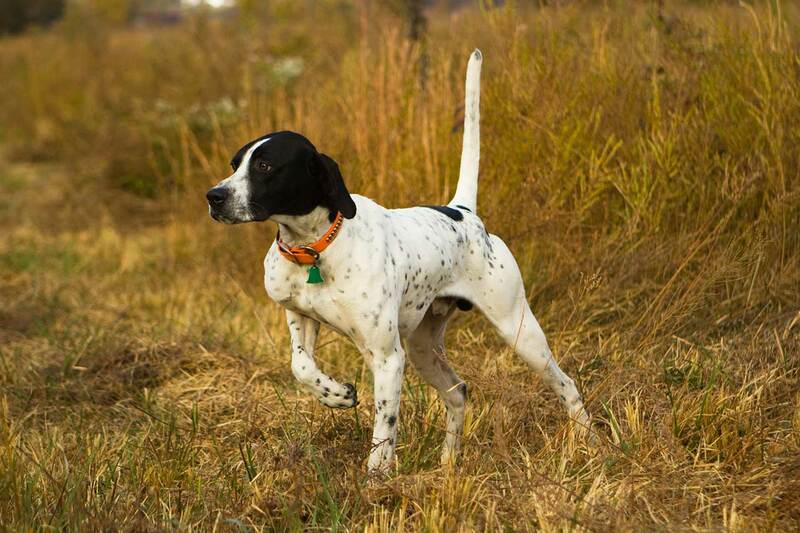 When it comes to the size of Pointers, there is a difference between males and females. 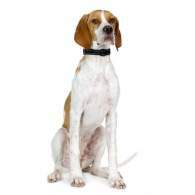 A typical male English Pointer weight is 55 to 75 pounds. Females average a fair bit less at 45 to 65 pounds. 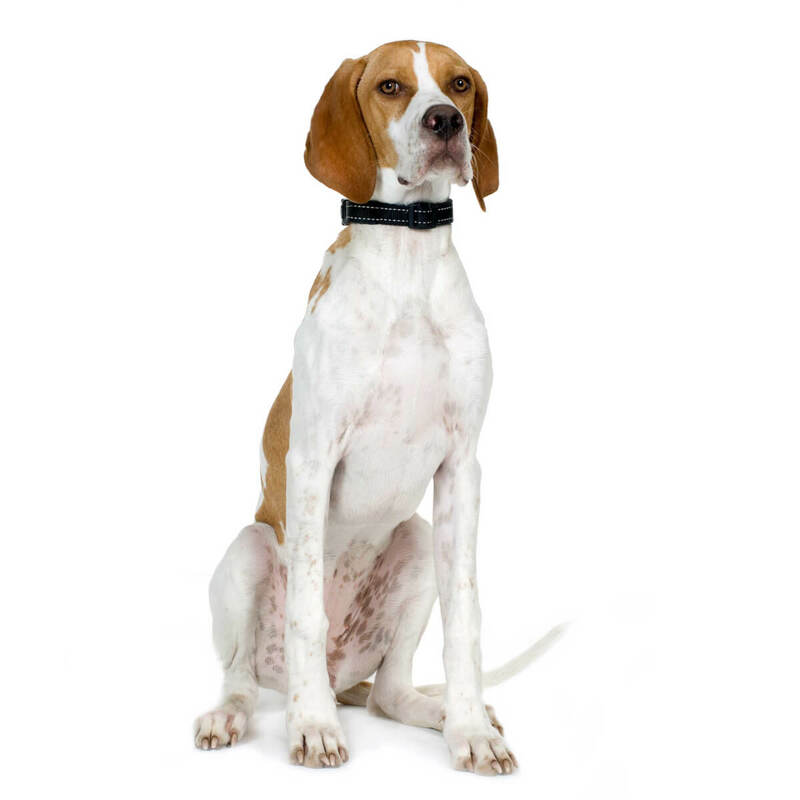 The same goes for the normal English Pointer height: adult males stand from 25 to 28 inches whereas mature females are shorter at 23 to 26 inches. If you want to make sure your puppy is growing properly, or that your adult dog is the right weight for his or her height, you'll want to get a Pointer size chart from your vet. There are no varieties of Pointers, per se, but there are two distinct bloodlines that are highly recognized among Pointer aficionados: the Elhew line and the Miller line. Both are said to be linked to the extraordinarily famous English Pointer from the early 20th century, Lexington Jake. Bob Wehle was renowned for his Elhew line, and the Elhew Kennels remains legendary and standing to this day. Spelling his name backward even as he looked forward, the Pointer line of the late Whele goes back to 1936. These days, puppies directly from this kennel — when they are available — can fetch thousands of dollars. Their coat colors may look typical to the lay person, but their stance and temperaments are prized by hunters. Elhew Pointers are slightly larger and said to be more robust than Millers. Miller Pointers, which is a more recently established bloodline, are said to be somewhat more difficult to manage and less consistent with the conformation. They are, however, highly sought by hunters for their performance. They are pure white and often called "White Dogs" (but not to be confused with the notorious "white dogs" of the 1960s civil unrest). Ferrell Miller is the person responsible for producing these dogs. While there are other lesser popular yet highly influential blood lines, there are basically no other different types of Pointers, especially miniature or pocket Pointer dogs. If you hear of a wiry haired, rough coated, smooth coated or short head Pointer, this has to do with different breeds, and usually with the German Pointer breeds. 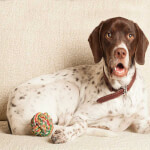 The Pointer temperament is easy-going once the dog is trained and socialized. Until then, you'll find the personality of this breed a bit goofy and his characteristics will lead to some frustration. Typical English Pointer behavior is a dog that is easily distracted, and it will take a lot of patience, treats and time to train one. 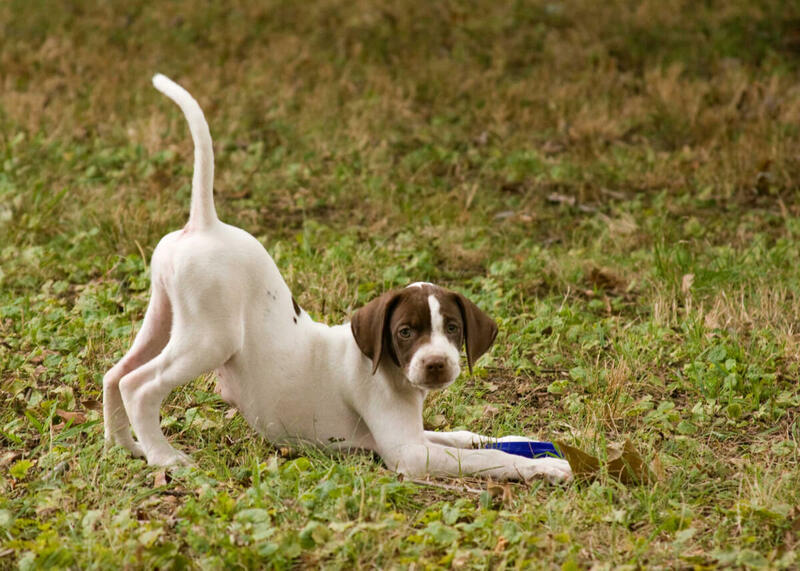 You'll find Pointer puppies lots of fun, but they will be slow to mature and somewhat resistant to obedience training. Get ready to repeat a lot of the most basic commands endlessly as well as to have lots of treats on hand. Once trained and properly socialized, you will have a dog whose traits tend to be loyalty, friendliness, and devotion. They'll also do very well in the field where they prefer to be. Keeping them even-tempered requires a lot of exercise and activity. If you are not a frequent game hunter, you'll want to spend a couple hours every day exercising your Pointer. A Pointer family dog is a great companion for your kids. These dogs will get along just fine with them. They love to romp, run and play endlessly. They are wonderful watchdogs and will sound the alarm if anything goes wrong or anyone approaches. It should be noted that as puppies, they are still developing. As such, kids should be taught to play carefully. As mature dogs around toddlers and very small children, Pointers should be supervised so that they don't accidentally knock over the kids. If your kids tire out your family Pointer, that will be a great day! Pointers get along well with other dogs. If socialized with the family cat, they should do fine there too. Strange cats might not be seen the same way, however. If your Pointer gives chase, it may not end well and it is sure to be hard to control the dog. Probably no amount of training will prevent them from going after birds. Pointers have an extremely strong hunting instinct and it typically starts to appear around two months of age. They are bird dogs by nature, so having pet birds is not recommended. Below are pictures and images of the Pointer dog breed. Living with an English Pointer requires more than a fair amount of responsibility. They can't be left alone for long or frequently, they are not hypoallergenic and they need a lot of exercise. On the other hand, they don't bark much, they shed very little and they are happy to just be with you as you move about the house. As these dogs are literally bred to hunt, they are not adaptable to apartments, small homes or place with no yards. A large rural setting is best for them. Since they are bird dogs, however, you don't want them roaming freely as they will chase down small animals that may be rabid or the neighbors' cats. English Pointers are not hypoallergenic, but they shed very little. They have few grooming requirements so it's easy to practically prevent allergy issues for people who have English Pointers as pets. 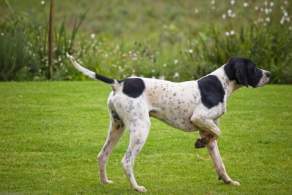 Pointers are dogs that some kennels have carefully managed for several decades if not a couple centuries, but there are breeders who have been less than careful. This latter group may be responsible for less than very healthy dogs. The health clearances you should absolutely have are from the Canine Eye Registry Foundation (CERF), Orthopedic Foundation for Animals (OFA) and Auburn University (for thrombopathia). To make sure a health clearance is legit, check the OFA Web site at www.offa.org. Pointers have an average lifespan of 12 to 15 years.